Can You Handle This Clay Matthews–Approved Arm Workout? The main problem I have with working out is myself. I can’t keep up with a rigid plan because I get lazy. And look, squats and push-ups are boring. I’ve found that the Rx for this problem is to trick my dumb self by weaving in new exercises as often as possible. Try it. Working out will feel less repetitive, and your brain will be excited to do 100 jump squats in a row. Victory (not to mention searing pain in your quads whenever you sit) is yours. 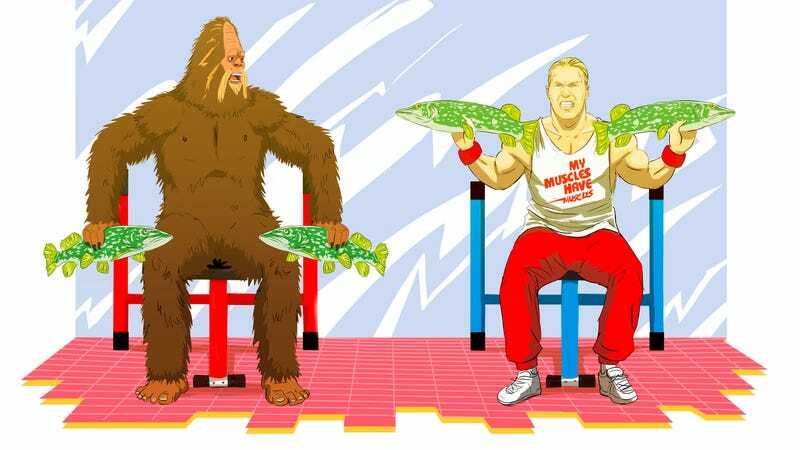 This is why you have to try the Sasquatch Workout. It combines protein-packed Jack Link’s jerky with things found in nature (because, recycling) like logs, fish, and other woodland creatures to create a unique program that won’t bore you to tears. Really. Get started with the following two exercises, with their proper technique. Step 1: Sit on a bench. Step 2: Use your thighs to brace yourself as you hold the fish at shoulder-height, palms inward. Step 3: Press each pike up above your head as you exhale. Turn your palms outward as you lift. Step 4: Inhale as you return the fish to starting position. Step 1: Stand with your feet a little farther than shoulder-width apart. Step 2: Hold the fish with both hands and swing it right to left across your body. Step 3: Pivot on the ball of your back foot as you swing, alternating feet as you move side to side. Both of these moves are easy enough to do at home or outside with the right equipment (er, wildlife). And don’t be afraid to embrace your inner Sasquatch: With a little fish-fueled hard work, you’ll be rocking that wilderness bod in no time. And don’t forget to add some much-needed protein to your diet with Jack Link’s jerky.